Lofting is the simple art of turning the small-scale plans of the boat designer, into the full-scale plans you need to make patterns for various parts of the boat. It's a bit like dress making. But in boat building mythology, lofting is the eye of the needle through which all prospective boat builders must pass before entering boat building heaven. Every boat building book has a chapter that insists that lofting isn't a black art, that any damn fool can do it. They then try to demystify the supposed non-mystery with language and diagrams so impenetrably complicated that the mind -- at least this mind -- boggles. Even Wikipedia, the giant online encyclopedia that can explain Nuclear Fusion with enough detail to threaten national security, sputters out after a few confused sentences when trying to explain the ancient and humble craft of lofting. They throw in the towel saying: "Generally, boat building books have a detailed description of the lofting process, beyond the scope of this article." 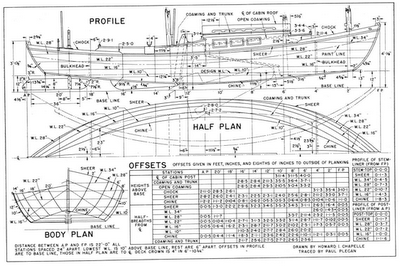 Boat designers encode their designs onto paper using three standard views -- Profile, Half Plan, and Body Plan -- and a table of numbers called the Table of Offsets. This standard system of encoding the plans for a complex three-dimensional structure onto paper has evolved over many years, and is an extremely efficient way to capture the essential information needed to reproduce the boat it describes, which is why it reminds me of DNA. If you follow these simple steps, you end up with the plans above, full-size. This task isn't really complicated, it's just persnickety and time consuming. Having spent 25 years doing the most persnickety and time consuming work ever invented -- computer programming -- I found lofting the plans for Cabin Boy to be both sublime and incredibly relaxing. Compared to debugging a C program, for instance, it was a romp in the park. Now, I have no doubt that lofting a 55 foot schooner would be a long and arduous job, and I have no idea where I could borrow the gym-sized space I'd need. But building a 55 foot schooner is the equivalent of cloning a Tyrannosaurus rex. Building Cabin Boy is more like cloning a one-celled animal. I was pretty sure I could do it. My first step was to prepare a lofting board. While you'd need a huge space to loft a big boat, the full-size plans for Cabin Boy are small enough to fit on one 4x8 foot sheet of plywood. Traditionally, this is laid on the floor and the builder lofts his plans on his hands and knees. Gardener's knee pads are highly recommended. Unfortunately, my only practical building space was a semi-finished room in the basement. There wasn't enough floor space for both a sheet of plywood and an 8' boat mold, so I decided to mount the plywood vertically on the wall, like a school black board. 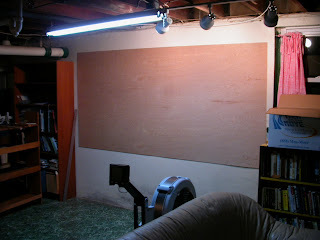 In fact, as I stood back to admire this 4'x8' sheet of plywood, mounted perfectly level on the wall, with 12 heavy-duty concrete wall anchors, I realized I had just completed my first wood working project, ever... and it was really pretty trivial. I wondered why I felt so good. Helena came up behind me, put her arm on my shoulder, and helped with the admiring process. "You've started," she said. And she was right. I'd cast off the lines to the Pier of Procrastination, and was on my way. Next I'd lay down some lines. You should take a picture every day like that guy who took a picture of himself every day for a year. that way we can see the full progress from beginning to end! Cool idea! I could probably make a video out of it. Denny Wolfe again with a comment about lofting and a little tip for your vertical board. Last first, if your boat is less than 8' wide vertical is the way to go. Lot easier on the ole bones. Plus, get a 4' drywall installer's T square (~$10, Home Despot)and slide it along the top edge of the plywood - instant perpendicular lines. On lofting: Its real purpose is to define a smooth surface in three dimensions. The table of offset points may not and probably will not give a smoothly curved lines in all three views. You draw a smooth line in one view and transfer points from it to another view. If its not smooth there you go back and adjust the line in the first view. This back and forth goes on until you say "screw it, good enough". Just like when you decide to stop sanding. Good luck. At least at this step you can erase your mistakes. If the table of offsets was perfect and you drew the body plan out full size perfectly you would not need to draw the plan and profile views. The Gougeon book about epoxy construction gives the clearest explanation I have found. Thanks for the tips, Denny! Dennis on lofting: Great comment. John: I made a B in Java programming at a community college. But I am woefully inadequate for the task. I should stick to bending wood. Definitely. Woodworking is lots more fun that programming.